The Edifier S2000 Pro is just my second pair of bookshelf speakers. I used a system with the Creative E-MU XM7 speakers and Sound Blaster X7 DAC/Amp 2 years ago; I really loved them but its sound quality couldn’t beat the convenience of soundbars. So I used some TV soundbars for my living room since then. 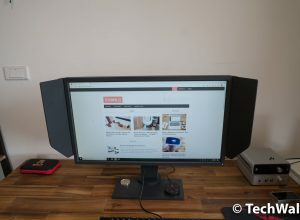 I’ve tested the Edifier S2000 Pro for over a month and I can’t come back to any other system. Let’s find out why in the review. In terms of design and features, the Edifier S2000 Pro totally outclasses my previous systems. The product comes with two bookshelf speakers and a remote control. I’m very surprised with its elegant and luxurious look. The speakers are fairly heavy since the enclosure is made of thick wood. The combination of the black piece with two genuine birch sideboards looks amazing and it could easily blend into any furniture. Other details like the gold feet and leaning-back front panel make the look even more appealing. The right speaker is the primary unit since it has all controls and connections. The left speaker only has one port to connect to the right speaker. 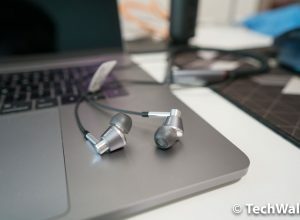 Notice that it uses a proprietary 5-pin connector to connect the 2 speakers, it is said to separate treble and bass and reduce interference. Here you can also see a small display showing the current input and indicate sound mode when you make the change. Inside the box, they provide some cables including a 3.5mm-RCA cable, an RCA to RCA cable, a speaker-connecting cable, and an optical fiber cable. On the back of the right speaker, you can find the volume dial/input selection, treble dial, bass dial, AUX in, Balanced XLR input, Speaker out, Optical in, Coaxial in, and a power switch. I just wish that they could add the HDMI (ARC) port so that I could connect it to my TV and control the speaker easier. At the moment, I’m using the Optical port and always need to use two remote controls to power on/off or adjust volume. This is a little inconvenient as compared to my previous soundbars. Notably, these are Bluetooth speakers, so you can also pair it with your TV or listen to music from your mobile devices. 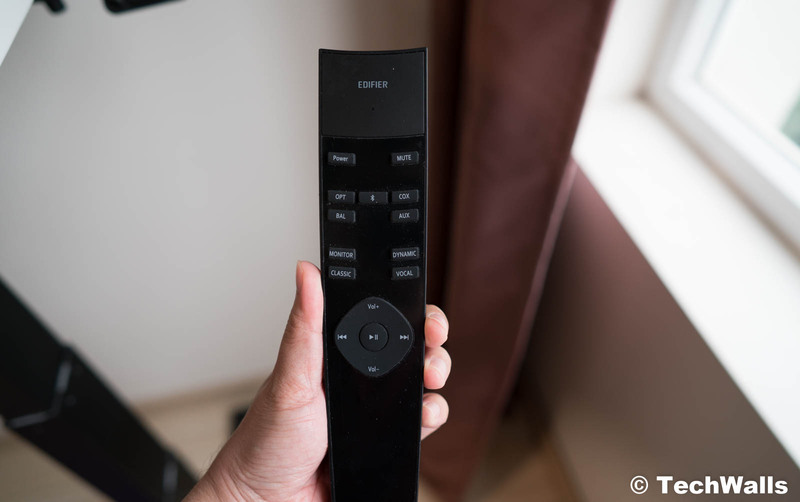 Edifier uses the CSR8645 chipset for Bluetooth 4.0 connection, it features the aptX decoder for lossless audio playback. The remote control allows changing between inputs, and switch between some preset modes like Monitor, Dynamic, Classic, and Vocal. I really love the clean setup since it doesn’t require any receiver or DAC/Amp. Just place the two speakers on 2 sides of my TV, plug some cables, and they are ready to use. 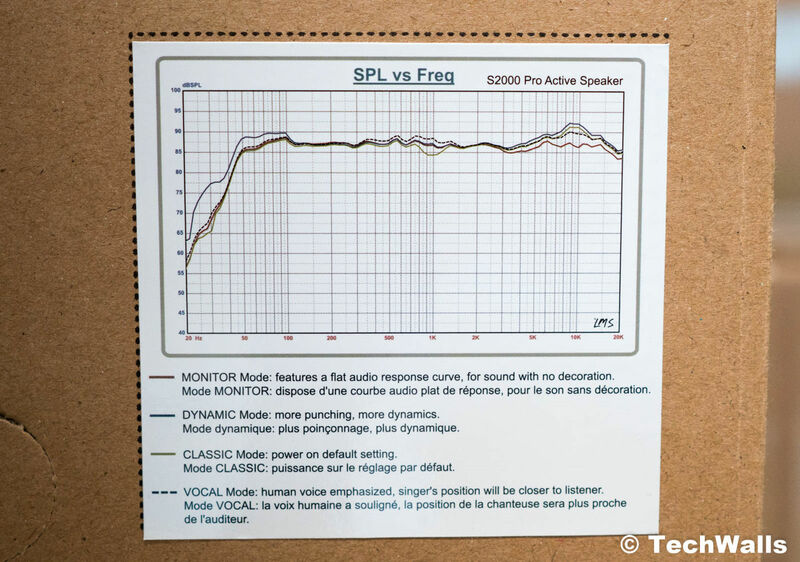 Before diving deeper into the audio quality, let’s check out some specs of the speakers. Now, let’s check out the sound test below. There are just 2 bass ports on the back but the low frequencies sound really good and there is no need to add a subwoofer here. I am using the speaker in a 650 sq ft living room and the bass is very powerful. I even had to set the bass level on the back to less than -4. There are 4 preset sound modes on the speaker, which are Monitor, Dynamic, Classic, and Vocal. Edifier even printed a frequency response graph comparing all those modes on the outside of the box. The two modes I use the most are Monitor and Dynamic. The Monitor mode has the most neutral sound while the Dynamic mode has some boosts in the lows and highs. The frequency response is almost flat down to 50Hz; if you want to fill the lows for a better sub-bass, you will need a subwoofer. However, it’s totally unnecessary for most average consumers who are using the speakers in a medium-sized living room. 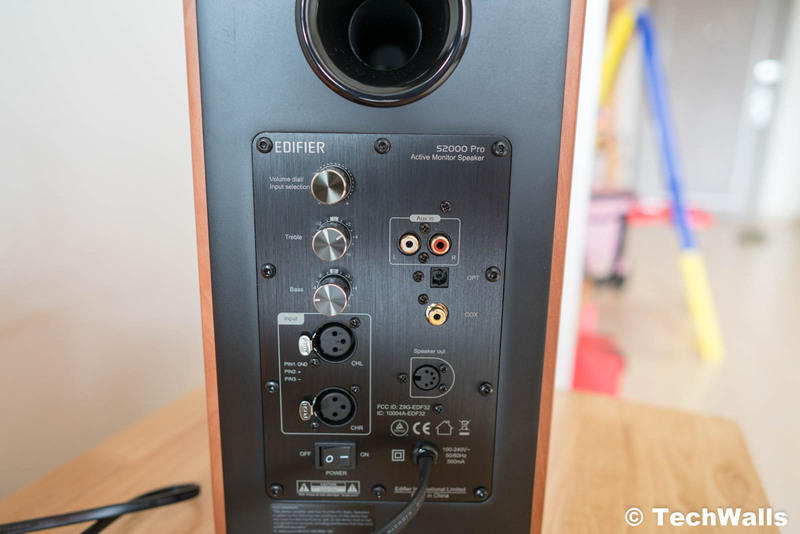 Considering the fact that the Edifier S2000 Pro is even cheaper than my previous system from Creative, it is very interesting to see it even has a better performance. I’m not a professional audio expert but I can guarantee that the speakers are amazing. Once you hear a good sound, you will enjoy your music collection and won’t be able to leave your couch. What I love most about the sound is the clarity of the mids. I no longer can hear a muddy sound and faded vocal like my recent speakers. Instead, the Edifier speakers show off the mids, reveal a lot of details and you will absolutely enjoy the clear mids. The treble is also very well tamed, it is thick and clear while not too bright to ruin your music. 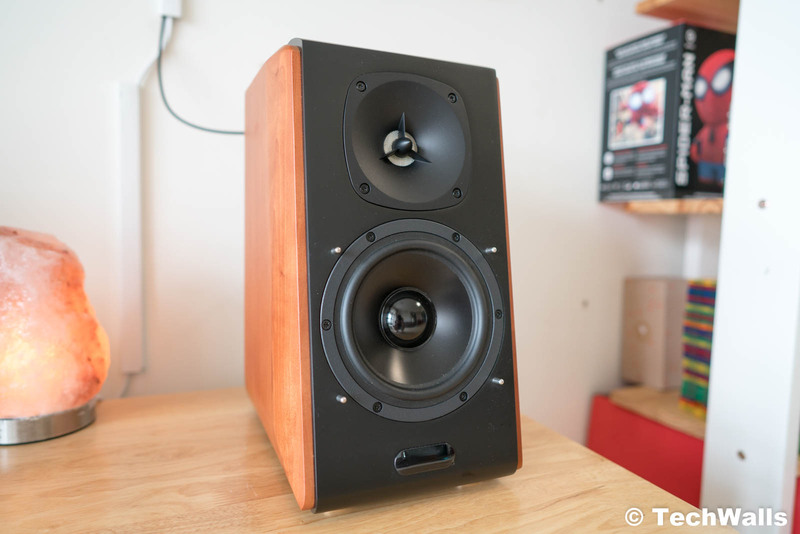 The stereo imaging of the bookshelf speakers is just average. Obviously, they can’t compete with multi-channel systems. The sound is amazing but you won’t feel the surround effects when watching movies. Having said that, the soundstage is quite good for the size and when comparing to other bookshelf speakers. 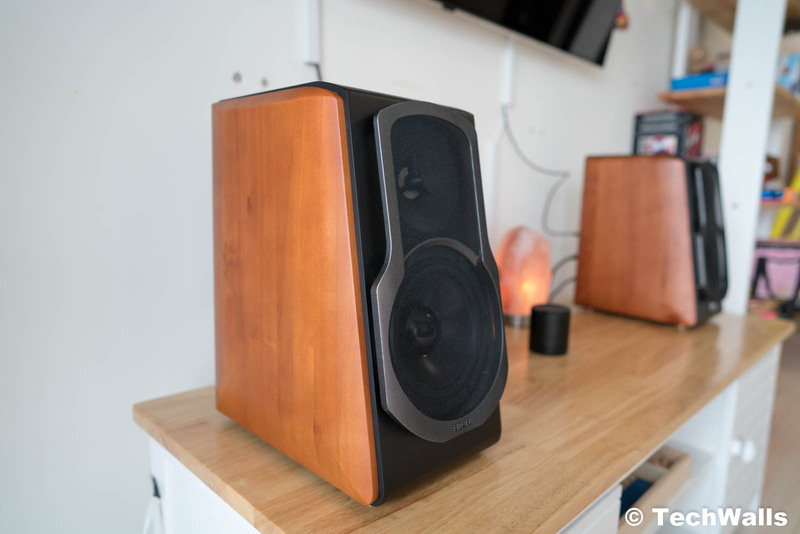 The Edifier S2000 Pro bookshelf speakers are priced at just $399 at press time and I have no doubt they are among the best speakers at the price. They do not only look good with a classic design but also sound amazing. We at TechWalls highly recommend the product. A beautiful sound system with a satisfying sound. I’m 100% sure it’s better. I am using the Edifier and Google Home Max, they have almost the same price but the sound quality of the Edifier is on another level. 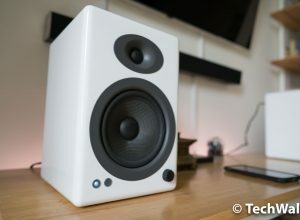 Hi, I`m looking for this speaker, but all stores are OUT OF STOCK, where did you find them? They are out of stock everywhere because there’s a known design issue that’s causing some undesirable sound reproduction on a lot of the speakers. I currently have these and contacted Edifier with regards to this. They are working on a redesign and will be replacing the affected units within a few months and they’ll probably go back on sale at that time too. I was planning on buying these soon and stumbled upon your comment just now. Could you elaborate what type of sound reproduction issue you are talking about? It would be a real bummer if I ordered a pair and got defunct ones. Btw I’m planning to buy them on alixepress, edifier seems to have an official store there, so I don’t know if that stock has any difference or not. There is a small gap that formed where the side wood panel meets the speaker housing compartment. Air is being forced through there and it’s producing an undesirable buzzing/vibration noise especially with more bass heavy songs. Only one of the speakers developed this problem for me, the other is fine. And they are still usable, I just can’t turn the volume up as much. In my opinion you should just wait for the redesign and purchase them from amazon when they go on sale again, the speakers are beyond worth it for the price. Same problem here, i will contact Edifier about revision and replacement. On the Chinese market there is a new model with different kind of wood, maybe this will become later the international revision of S2000PRO ? 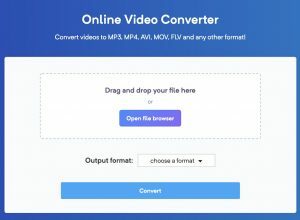 How I can see that I have the newest version? Are there any differences? Thanks. Just bought them with Aliexpress, good price!!! Hello and please excuse my Naivety. I am very new to the audiophile scene. I am getting a turntable and CD player. I was going to buy a NAD C 316BEE and connect them all through that, including my TV with a pair of Wharfedale 11.1’s. I have since seen many reviews on the Edifiers and would love to try them out. Can I connect all said appliances through the just Edifiers, or should I still get the amp and connect them all up together? You do not need an amp. Already included and also a DAC is included. I have these hooked up to my desktop computer. The highs a mid-ranges are of a superior sound. Very clear and crisp. Was not so impressed with the percussion/bass that much. I don’t know what the science or technology is on the s2000 pro’s are and not really interested. I hooked up my DragonFly DAC red. Also I installed a Surge force equilizer on my computer. When carefully tweaked starting at low volumes, this made a tremendous difference that was just amazing. Don’t know if this is recommended or not, but have had these for decent time now with no problems and would compare these with just about any speaker out there.I paid $399.00 for these directly from Edifire USA. I just set up my S2000 Pro’s on my desktop with my Mac. I also hooked them up through my DragonFly Red DAC and found quite a big improvement in the sound quality, not to mention volume. I realize that the speakers already have their own integrated DAC. Is there any disadvantage to running them through the additional DAC? Also, would it be advisable to mount them on speaker stands in order to get them further apart and off the desktop?